Could this be the best bodycam for your organisation? (Advertorial) Front line staff are increasingly being issued with body worn video cameras (bodycams) to capture a secure point-of-view record of what happened during an incident. The video and audio recording can then be used as evidence if the material is correctly handled and stored. Bodycams can help to deter verbal abuse and aggression, as people often calm down if they know they are being filmed. As such they provide an additional means of protection for front line staff and lone workers. The recorded evidence can also be used to refute false allegations made against staff in many walks of life. Fire, ambulance and police officers are now deploying bodycams. They are also being given to prison service staff, private security officers, healthcare workers, railway workers, traffic wardens, parking attendants and other lone workers, who sometimes face abuse and the threat of violence in their jobs. Bodycam footage can also be used for wider purposes such as training. Footage can be used to demonstrate best practice, provide feedback on an incident, to observe the interaction between staff members, and between them and the public, and to show new recruits the kinds of incidents that can take place. There have been some high profile incidents in the UK and the USA of police and armed security guards shooting members of the public. Video from bodycams can be particularly important in these incidents to demonstrate whether the security officer’s story matches the visual evidence. Before issuing staff with bodycams it is important to ensure policies are put in place. In many countries the use of bodycams may come under CCTV surveillance and data protection legislation. For instance, in the UK, if staff are using bodycams in a public place, they should adhere to The Protection of Freedom Act (POFA) 2012 and the Code of Practice for Surveillance Camera Systems, which has 12 main guidelines. The UK’s Security Industry Authority (SIA) warns that anyone using a bodycam to monitor the activities of a member of the public in a public or private place, or to identify an individual, may require a Public Space Surveillance (CCTV) licence depending on the operating circumstance. They must also abide by the Data Protection Act, including observing the correct protocols for the handling and storage of video footage and audio recordings. In short, employers must ensure their staff act responsibly, and be seen to be doing so, when it comes to protecting people’s privacy. Responsible advocates of bodycams argue that it is best to be very open about their use, so people are aware they are being filmed or that they could be. Once they know this, it usually has the effect of deterring anti-social behaviour. If you have invested in a Hytera radio system, or are thinking of doing so, it makes sense to consider the new VM685 bodycam. The VM685 is a remote speaker microphone that doubles up as a video bodycam for capturing, storing and analysing evidence from the field. The innovative in-built remote speaker microphone allows users to communicate efficiently from the push-to-talk on their VM685, routed via their Hytera radio, even initiating an emergency alarm, connected to the radio via cable or Bluetooth. 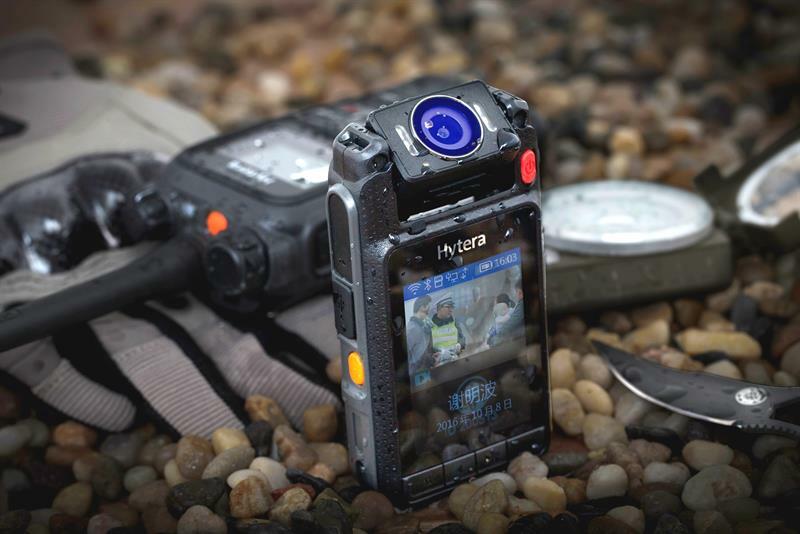 The VM685 can also deliver real-time video streaming when paired with the Hytera PDC760 Multi-mode Advanced Radio, which can support 4G LTE broadband. Alternatively, the VM685 can be used as a stand-alone bodycam device. Up to 1080p at 60 frames per second – quality high-definition video. Dual microphone to capture clear audio. Automatic infrared to record in low light conditions. Up to 6 hours of continuous recording and easy battery swap. Up to 128GB storage capacity, equivalent to 44 hours of 1080p recorded footage. Waterproof and dust-proof (IP67 rated), certified mil-standard (810G) with a 1.5m drop test. Flexible, universal mounting clip as standard. Rotating camera head to capture clear footage no matter what the mounting position. 3rd Party mounting options available. One-touch record buttons and emergency button with incident time, tags and watermark options. Simple menu options on the device, can be used in covert mode or with the screen on show. The VM685 can be charged, programmed and data extracted from the internal memory via the included Micro-USB using the free RVM manager software. Utilise the multi-charger (MCA22) to charge 6 devices and 6 additional batteries.